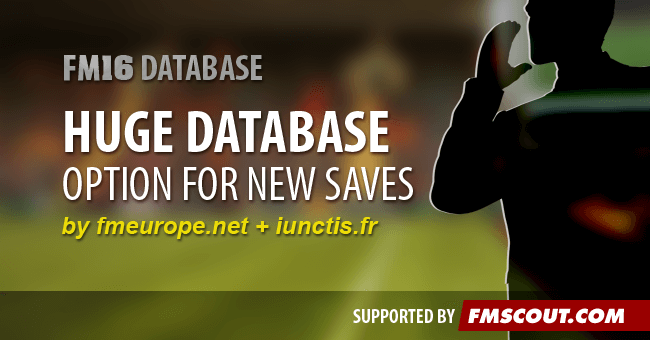 This will add an option for you to select huge database when starting a new save game in Football Manager 2016. By default, when creating a new save-game you can choose between small, medium and large database size. This file will give you the choice of loading even more data. The huge database option adds nearly 4,000 players to the extensive database which gives you more choices. Be careful though, a larger database may slow down your game. This is mainly an option for people who don't want to bother with custom / advanced database settings for their game. Huge database will load more players compared to the other database size options. Use a tool such as 7-zip for Windows or The Unarchiver for MacOSX to extract the contents of the downloaded .zip file. Open Football Manager 2016 and go to Preferences > Interface. Click the "Clear Cache" button. Click the "Reload Skin" button. • From FM16 start screen, select new career game and choose the type of save. • After the first screen where you Choose Nations, you arrive to New Game Overview screen. • In the lower part, open the drop-down menu "Database Size" to the right. • The choice "Huge" should appear after Small, Medium and Large. • You can also use the "Huge" option in the Advanced... database settings menu. This addon was created by Steven (iunctis) & Deco (FMEurope). FME was founded in 2004. On our website you can find a database update, which is our main product. But we also create some graphics as logos, kits or faces. Moreover, there is also a Coaching Academy which helps the members who want to understand the tactic aspect of the game. At last, you can write your story and/or read the stories of our members. We hope we will meet you soon on our forum. thanks for sharing Deco; much needed indeed but one quick question: why does not SI provide this option?